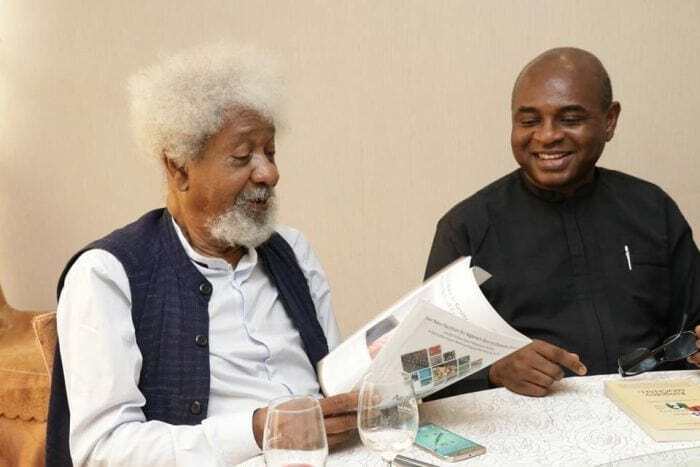 On Friday, Nobel Laureate Professor Wole Soyinka, in a statement, endorsed the presidential candidate of the Young Progressive Party, YPP, Professor Kingsley Moghalu. Soyinka had, a few days ago, called on Nigerians to vote for a candidate different from President Muhammadu Buhari of the APC and Atiku Abubakar of the PDP. Let me reiterate: there is over-abundant, but stifled leadership material, and there can be no excuse, now that that potential of high quality is being manifested, for constricting the political space in a population that is nudging two hundred million. And that statement is of course specially addressed to those who took part in this exercise, those who deliberated opted out of it, some of whom were assessed anyway. Such potential compelled us (Citizen Forum) to exercise utmost rigour in what proved to be a most daunting exercise. The final determination however is – the flag-bearer of the Young Progressive Party – KINGSLEY MOGHALU. Read Soyinka’s full statement on Premium Times. I think this improves my chances in the election. We appeal to all other alternative candidates to join us in a coalition under my leadership to defeat the old, recycled political class in this country once and for all. We also appeal to others who may be looking at other processes of consensus to consider ending their search with me just as Professor Wole Soyinka and the Citizens Forum have done.